*Chip is proud of the family tradition behind Bachara Construction Law. His father, Hank, returned home from WWII service in the Pacific to establish Bachara Builders, eventually constructing projects including Jacksonville’s Grove Park neighborhood. Having begun working for his father’s construction company* at the age of 14, Chip Bachara was eager to begin his degree program in Building Construction at the University of Florida a few years later. Not surprisingly, his studies at UF included site visits to a variety of construction sites in North Central Florida, complete with a requirement to wear hardhats and steel-toed boots. Chip and his fellow students were proud to own a hardhat bearing the School of Building Construction logo. By graduation, however, they looked forward to trading in their college hardhats for headgear bearing the logo of an employer. After obtaining his degree, Chip worked for three construction companies, gaining a new, company-branded hardhat with each job – and keeping each one as a memento. Years later, Chip decided to dust off and display the hardhats in his office. To his surprise, the unusual collection drew a great deal of interest and was a topic of conversation among clients and fellow lawyers. Upon starting Bachara Construction Law Group, Chip decided to issue his own hardhats. 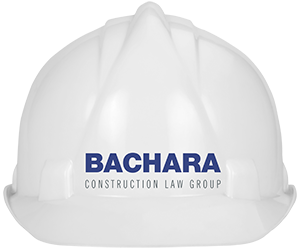 Now, whenever Bachara Construction Law Group lawyers perform site visits, they wear hardhats bearing the firm’s logo. The hats are a symbol of the firm’s commitment to the industry and desire to build the kind of trust and confidence that keeps clients coming back again and again.